2005; 382 pages. Genre : Fantasy. Overall Rating : B.
Thud! is the name of a board game played in Discworld. The pieces/sides are dwarves and trolls, and the game is unique in that you have to successfully play it from both sides in order to win the game. Thud! is also the sound Grag Hamcrusher's skull made when someone bashed in the deep-down dwarf's head . With a club. Possibly the troll's club found beside the body. It's now up to Sam Vimes and the City Watch to solve the murder before the Trolls and Dwarves turn Ankh-Morpork into an urban battleground. The Wodehousian influence is readily apparent in the tangle of plot lines going on here. Besides the murder and imminent ethnic warfare mentioned above, there's the first vampire to join the City Watch; a huge painting done by a deranged artist that just might hide some clues about some secret or treasure (a Pratchett tweak at the Da Vinci Code); a nasty "dark" monster that I swear was also in The Wheel of Darkness, reviewed here; and last but not least, there's Sam Vimes hurrying home each night to read "Where's My Cow" to his son. All these disparate lines get nicely tied together by the end of the book. Oh, and for you romantic types, there's even a love story between one of the guards, Nobby, and a sweet young thing named Tawnee. Yes, she's a pole-dancer, but is that any impediment when it comes to true love? This is something like #34 in the Discworld series. The only other one I've read is #8, Guards! Guards!. (I must have a thing for exclamation marks in titles). Thud! doesn't pack as many laughs-per-page as G!G! did. It kinda reminds me of the TV series M*A*S*H in its latter years. Less yucks, more message. Thud! does take on some serious themes - racial prejudice, affirmative action, and religious fanaticism, to name a couple. Yet at its core, it's still a light-hearted, fun-to-read fantasy. 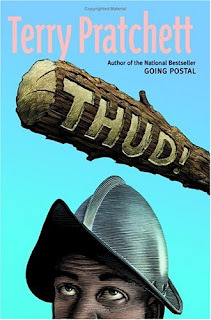 It is interesting to note that subsequent to this book, a real-world board-game "Thud!" was developed. And "Where's My Cow?" was developed into a real-world children's book. In the end, this is a good read, although it probably shouldn't be your introduction to Discworld. I did find the very first Discworld book, The Color Of Magic, at the used-bookstore; and I'm looking forward to reading the "genesis" of this decades-popular series. So what has Pratchett written besides the Discworld series? I know he co-wrote something with Neil Gaiman, and I considered picking that one up when I was going through my Neil Gaiman phase, but don't think I'll be doing that now. You guys have written enough about Pratchett now that I think I have to experience one of his books, but I think the Discworld series might be a bit much for me. I think they would spin my head around with all the plots and characters. I'd need to start with something lighter, I think. Any suggestions? Has he written anything else? he's written a few non-Discworld books. i think i saw one at my local library this past weekend. but i limited myself to one book only, as i wanted to make sure i could figure out the automatic check-out machine. so i chose a P.G. Wodehouse book, since they also had a nice selection of his stuff. as far as a good book to delve into this series, i'll defer to Byron on that, as my total Discworld knowledge is now two books. of those two, i'd definitely start with Guards! Guards! one main character, Carrot, gets introduced in G!G!, and it wasn't too hard to get a grip on the other main figures. i suspect Pratchett deliberately wrote these books to be stand-alones as well as a series. I think between the two of you, there have been four Discworld books written about so far. They feel a little too fantastical for me. I'm afraid I wouldn't be able to get into them. The Gaiman/Pratchett book sounded interesting, but I've already got one Gaiman book next year and after American Gods, I'm not sure I want more than that. I was just curious if there were anything other than the Discworld ones out there, and if anyone had read any before. I'll have to check out my library's cache.